Feathers welcomes you to participate in the fifth Duel Competition. It is a group staged tournament which ends with a single elimination. Go Here to Sign up and compete. Please note in the event of the server being down, contact Feathers, Tirza or Groentjuh. Playing the Duels: Tier 3 Units only! Every Player plays 20 Duels with each race. Players shall use the main duel area to play their duels. If no players schedule both players lose automatically. And takes 40 to there death tally. If both players schedule but can't come to a conclusion on when they will play, then they must play 18gmt the day before the final competition takes place. If a player attempts to schedule and gets no response after the upcoming fixture, the player that doesn't attempt to schedule gets an instant lose, while the other gets an instant win (gaining 40 kills in the process, while the loser takes 40 deaths). 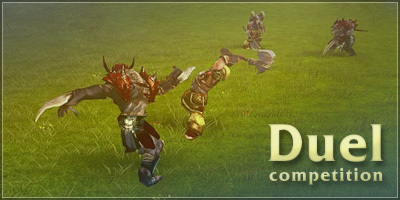 Too enter the final competition you must have completed all allocated duels in your group. Submitting the results: Post in your allocated group thread. Hacking: Absolutely no cheating. No tolerance against Cheaters. If you cheat you are disqualified. This also includes using referee powers, for example: Chiprel someone in a duel. Forfeiting in Duel: Participant wins that singular duel. How people get placed into groups is dependant on how many people sign up. -During the finals; if a player has failed to turn up, then the person below him in the group stages can take his place i.e. 4th placed person doesn't show, the 5th placed person takes part(if he's available). Some people have asked questions, I've answered them and compiled them together for you. If you're unsure of anything, please ask. Q: What happens if they don't play until 18 GMT that day? Both lose automatically? Q: Can several players tie for the same spot in the group? How do you decide which player gets to the finals? A: In the highly unlikely event of this happening each player will play a fresh round of 20/20 on the finals day(before the competition starts/or during it before there scheduled finals match). But only if they have the same number of points and the same kill to death ratio. If you record a demo while playing and wish to submit to the acrhives please send it me, or make me aware via a link. 2) Realise there is a competition on. 3) It doesn't come into conflict with the NSL scheduling. Couldn't this have waited a bit? People are still too focused on the NSL to remember such a distant competition. 3) It does come into conflict with the NSL scheduling. In abit(a week or so) I'm going to request a front page topic. Also I gave three good reasons. Yes, but it still means people have to remember they signed up for this some time in the future. I'm only saying, start the sign up later to ensure only people sign up that will manage. Also, 3) you said "it does come into conflict", did you mean doesn't? So could you reconsider your timing? Other than that, I have no objections. It worked the last times, it ought to work again. And also makes sense to host another one after the NSL. Well as I said beside posted here and on every clan forum, as a warning to say: Hey look theres a competition. Closer to the time reminders will be sent out and a front post page will be done + those who signed up early will be sent a reminder. Then I'll just hope it works out this early. If no players schedule both players lose automatically. If a player attempts to schedule and gets no response after the upcoming fixture, the player that doesn't attempt to schedule gets an instant lose, while the other gets an instant win. What happens if they don't play until 18 GMT that day? Both lose automatically? To enter the final competition you must have completed all allocated duels in your group. Can several players tie for the same spot in the group? How do you decide which player gets to the finals? In the highly unlikely event of this happening each player will play a fresh round of 20/20 on the finals day(before the competition starts/or during it before there scheduled match). How do you arrange two people when they have the same number of games they won? My comment from the previous competition still got no answer. Will there be any changes in regards to that? It will be decided then highest number of points, then K/D then a tiebreak. What of Duelers from America or Asia?